The General Secretary of Health Services Workers Union of TUC, Brother Reynolds Ofosu Tenkorang, has said the existence of strong and recognized trade union is a prerequisite to industrial peace in Ghana. To the General Secretary of HSWU, history has it that decisions taken through the process of collective bargaining and negotiations between employer and unions have been more influential. This, he noted, has led to promoting and maintaining national integration by reducing the number of industrial disputes. He has therefore charged staff and members of the Union to go all out to organize and recruit workers in Ghana’s private health institutions. “It is important to note that any organization with trade unions always have a higher wage structure. Health services Workers Union negotiates with employers for better terms and conditions of employment and for healthy workplace standards” Brother Tenkorang noted. Adding it behooves on HSWU to endeavour to protect and advance the interests of workers within the private health institutions. 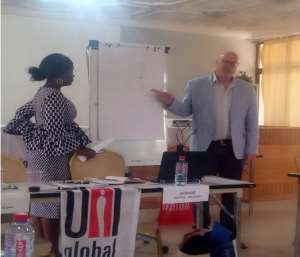 The General Secretary of the Health Services Workers Union made these comments to officially open a UNI Global Union sponsored a two-day residential workshop to sensitize selected staff and members of the Union with the requisite skills and capacity to organize private health institutions. UNI is a global and regional organization dedicated to improving the quality of life and working conditions of its members. UNI believes in putting people first in global, regional and national economic and social development. It shall support and advance the sectoral interests of its affiliates and promote the multi-sectoral interests of its inter-professional groups. Based in Nyon, Switzerland, UNI Global Union represents more than 20 million workers from over 150 different countries including the care in the fastest growing sectors in the world. A total of 90% of new jobs are expected to be in these sectors in the next decade. UNI and its affiliates like the health services workers Union in all regions are driven by a responsibility to ensure these jobs are decent and workers rights are protected, including the right to join a union and collective bargaining. Through its Sector Global Union, UNI Care in collaboration with the Health Services Workers Union of TUC Ghana is to prepare organizers and activists for the implementation of the plan for the care sector here in Ghana. Brother Nigel Flanagan- UNI Global Union Chief Organizer who is the key facilitator for this two-day training workshop said his outfit is committed to assisting the Health Services Workers Union plan to implement the aim of organizing in the private health institution. To Comrade Flanagan, Trade Unions are recognized to be champions of human rights and a vehicle to eradicate poverty. The Africa Regional Secretary of UNI Global Union, Sister Leocadie Bodjouo in a brief remark underscored UNI Global Union’s preparedness to partner Health Services Workers Union to best organize to reach the target set. She said the workshop is equally to update knowledge, change, improve, and innovate; participants to propel HSWU grow its base. Also present at this event were the Deputy General Secretary and First Trustee of the Health Services Workers Union Brothers Franklin Owusu Ansah and Godfred Oppong respectively.